A BBC journalist with sources inside the UK and US intelligence community has claimed spooks believe there is “more than one tape” showing Donald Trump in compromising and sexual situations whilst visiting Russia. Paul Wood, the broadcaster’s World Affairs correspondent, claims CIA officers deemed the ‘WaterSportsGate’ dossier as containing credible information and would not have presented it to Barack Obama and the President-Elect unless they thought it was “worthy of consideration”. 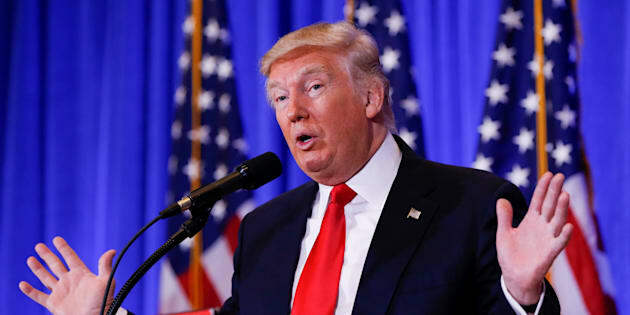 The sensational memos written by a former British spy were revealed by CNN and published in full by BuzzFeed News, and claim Russia holds compromising personal and financial information about Trump, a charge he strenuously denied in a press conference on Wednesday. US President-elect Donald Trump speaks at a press conference at Trump Tower on January 11, 2017. Trump’s transition has been shadowed by US intelligence assessments that Russia not only meddled in the election, but did so to help him defeat Democrat Hillary Clinton. After spending weeks challenging that idea, Trump finally accepted at least part of the intelligence conclusions. “As far as hacking, I think it was Russia,” Trump said, quickly adding that “other countries and other people” also hack U.S. interests. Still, he kept needling the intelligence agencies, saying it would be a “tremendous blot” on their record if officials were leaking information from his classified briefings. Trump also lambasted the media for peddling “fake news” and shouting down a journalist from CNN, which reported on the matter. His family and advisers clapped and cheered him on throughout, reports the Associated Press. Wood further elaborated in an article for The Spectator. The purported Russian efforts were described in a newly released and uncorroborated dossier produced back in August. But they had circulated more widely in Washington in October - following early reports and opaque warnings from elected officials that something was afoot involving the Kremlin and Trump. In October, Mother Jones magazine described how a former Western spy - assigned to look into Trump’s Russian ties for a private American firm - had presented his findings to the FBI in August. Those findings, the magazine said, were produced for political opposition research and said that Russian intelligence had compromised Trump during his visits to Moscow - information that, if true, could be used to blackmail him or undermine his presidency. The Wall Street Journal on Wednesday identified the dossier’s author as Christopher Steele, a director of London-based Orbis Business Intelligence Ltd., whom the Journal said declined repeated requests for interviews through an intermediary. Another Orbis director told the Journal he wouldn’t “confirm or deny” that Orbis had produced the report.